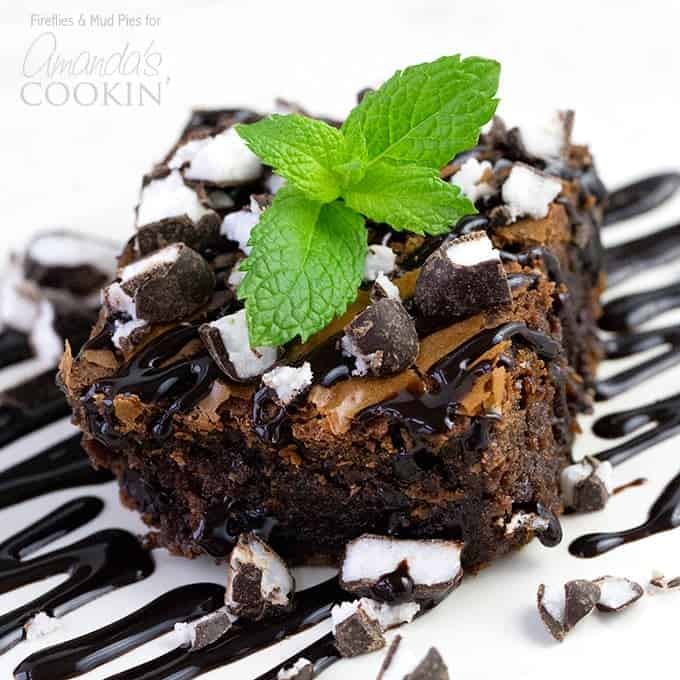 These Peppermint Patty Brownies are the perfect indulgence for when you are craving a rich, restaurant-style brownie dessert, but would rather stay home in your pajamas. 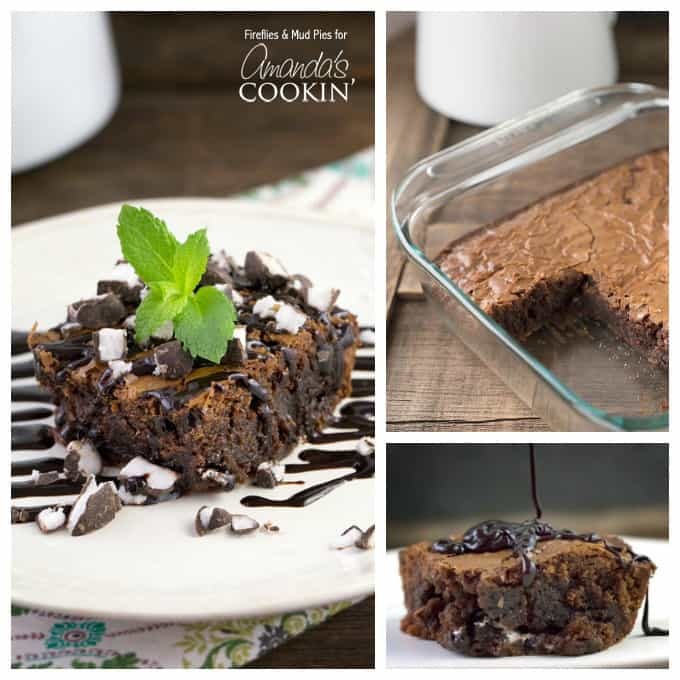 With boxed brownie mix as a base, this recipe is simple to make and a real crowd pleaser. Last month while visiting my grandparents’ home in Massachusetts, I spent some time sprawled on the kitchen floor, paging through my grandmother’s vintage cookbooks. I came across a peppermint patty brownie recipe from the 1950’s. Of course, the recipe called for a boxed brownie mix and called for pouring melted Peppermint Patties candy over baked brownies. According to my Grandma, using boxed brownie mix and cake mix was all the rage back in the ’50s. You could certainly use your own homemade brownie recipe if you prefer, but if you’re in a hurry, boxed brownie mix is a real time saver! Now, I don’t like to do a lot of dishes. I began to wonder how brownies would taste if chopped Peppermint Patties were mixed into the brownie mix itself, instead of just drizzling them over the top of plain brownies. The results were absolutely amazing! 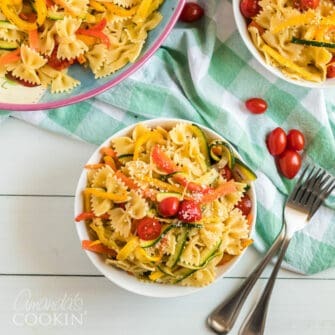 The bonus is there are less dishes and there’s no melted candy mess to clean! 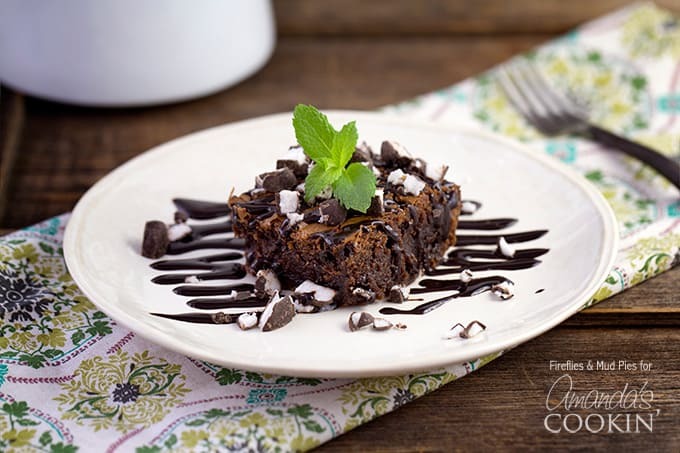 Prepare the brownie mix as directed on the box, adding 1 teaspoon of peppermint extract. Next, stir in chopped Peppermint Patties candy and bake as directed on the box (about 50 minutes). 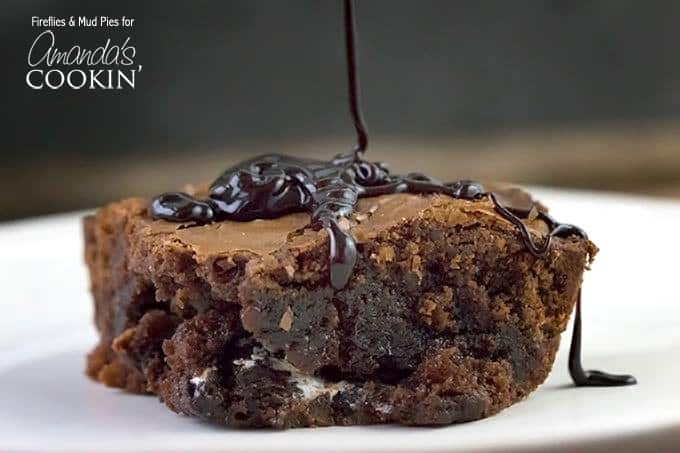 The Peppermint Patties melt into the brownie batter, creating a rich, fudge-like texture. Cool completely before cutting (it’s easier to cut cool brownies than hot brownies) but I do recommend warming them briefly in the microwave before serving! Chocolate syrup, chopped Peppermint Patties, and fresh mint are a beautiful, delicious garnish. If you would like to bake and take these, use a baking pan that comes with a lid, like this one. Once the baked brownies have cooled, cover the pan and bring your garnishes with you to top when you arrive at your destination. 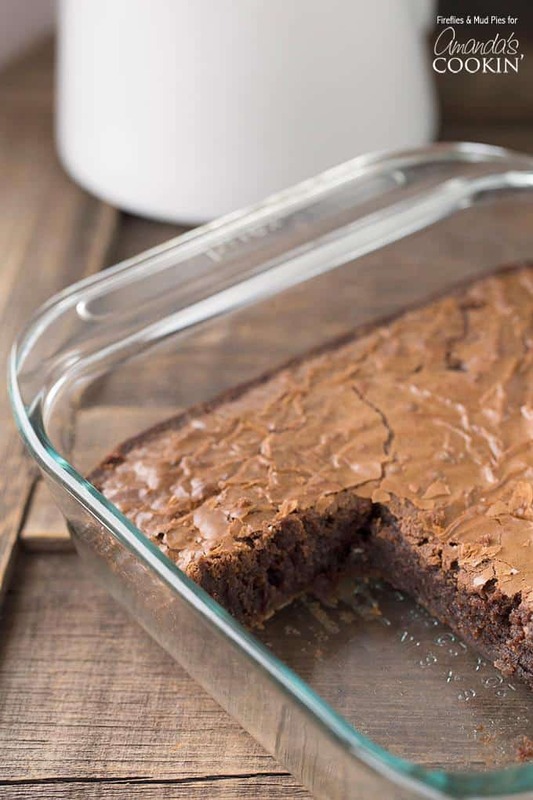 Lining your pan with foil or parchment paper, making sure it’s hanging over the sides of the pan, will provide “handles” that allow you to lift the entire block of brownies out of the pan so that you can cut them on a cutting board. It might be easier to buy the larger Peppermint Patties that are usually displayed near the checkout counter of your grocery store. Buying a bag of the smaller candies just means more unwrapping! 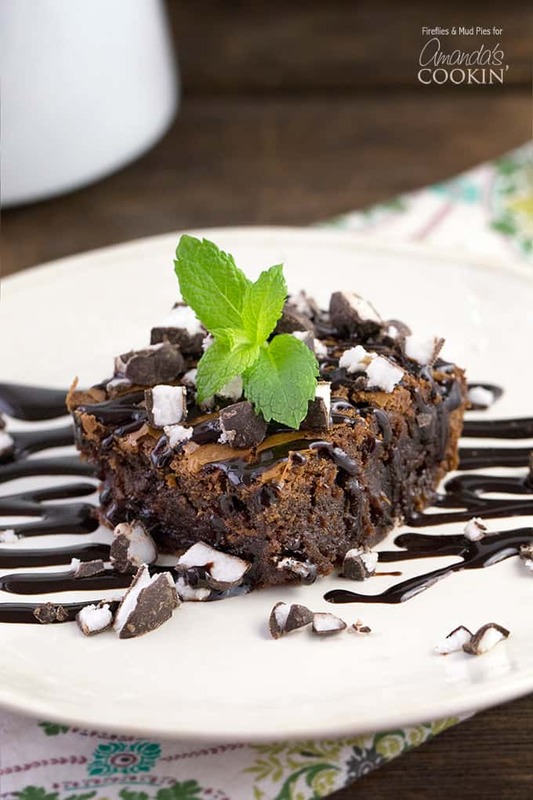 If you love chocolate, here are some other delicious desserts you might like! If you liked these Peppermint Patty Brownies you might want to try one of these amazing brownie recipes! For when you are craving a restaurant-style brownie dessert, but would rather stay home in your pajamas! Mix the brownies as directed on the package, adding 1 teaspoon of peppermint extract. Cool, then cut into slices. Serve warm, topped with chocolate syrup, chopped Peppermint Patties, and fresh mint. I have been searching for the 1950’s recipe!!! Is it as simple as making boxed brownies and melting th candies on top? Would you be willing to share? Need for.a birthday surprise that has to be “just like mom’s”. I also want to try your version. The recipe I found said to just prepare and bake boxed cake mix, then spread chopped peppermint patties on top. The peppermint patties are supposed to melt into the brownies, forming a minty chocolate layer on top. Hope that helps!